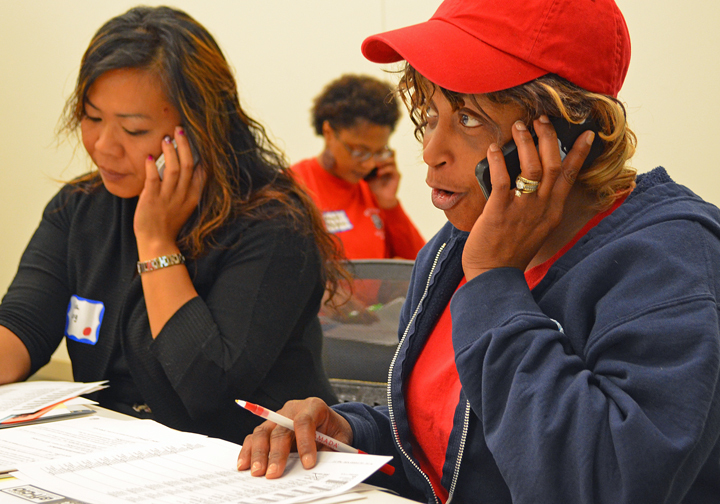 Linda Yang (L) and Diana Hill, members of CWA Local 7250, put their skills into action during a phone bank at the Labor 2014 campaign school in St. Paul. From TV ads to robocalls, technology has changed the way political campaigns communicate with voters, but the most effective form of voter contact remains the same: one-on-one conversations. That’s the guiding principle for Labor 2014, the statewide push to get union members to the polls in support of labor-endorsed candidates up and down the Nov. 4 ballot. Labor 2014 kicked off with a series of “campaign schools” across the state this summer, including one yesterday at the Minnesota Nurses Association offices in St. Paul. Re-electing Gov. 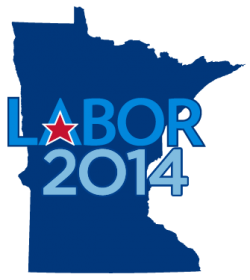 Mark Dayton and U.S. Sen. Al Franken – and maintaining a labor-endorsed majority in the Minnesota House of Representatives – top labor’s list of priorities this fall. If recent history is any guide, margins in all three contests are likely to be razor-thin. Dayton won election four years ago by less than 9,000 votes. Franken’s race six years ago was even closer, decided by a 312-vote margin. And eight races Minnesota House races were decided by 1,000 votes or less in 2012. In close elections, voter turnout critical, and Fredson said the Labor 2014 campaign will focus on contacting members who don’t typically vote during elections when there’s no presidential race and getting them to the polls. “A lot of these races are neck and neck, and we believe it’s the face-to-face contact with union members and their families that will make the difference,” Fredson said. The daylong training yesterday readied about 100 rank-and-file activists for that work. Political organizers from the state AFL-CIO and regional labor federations in St. Paul and Minneapolis provided a crash course in engaging voters on the phone, at the doorstep and in the workplace. The campaign school provided a first glimpse into the campaign world for Linda Yang. An employee of AT&T, Yang is a strong supporter of Dayton because of his support for public education and closing the achievement gap. Officers of her union, Communications Workers of America Local 7250, suggested she attend the campaign school. “It’s teaching me how to reach out to people I don’t know and talk to them about what’s going on and why we should vote,” Yang said. The campaign school also brought volunteers up to speed on issues in play during the 2014 campaign season. Alaric Poseley-Hatton, Secretary-Treasurer of Local 7250, said it was good to talk through common questions he’s likely to hear before hitting the pavement or picking up a phone. CWA members accounted for a third of the participants at yesterday’s training. State Council President Mona Meyer said the campaign school provided an easy introduction for members like Yang who are looking to turn their convictions into activism.